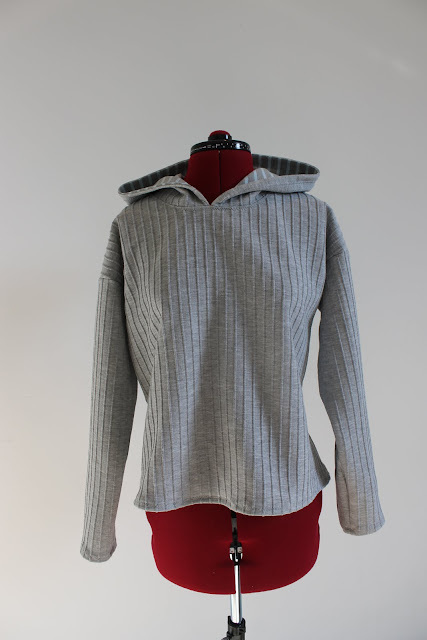 It turns out that Higgs and Higgs textured knit fabrics are destined for Stella Hoodies! My Mum asked me to make her a Stella Hoodie out of the fabric that she bought when we went to Higgs and Higgs after seeing and liking mine. I love how quickly this pattern comes together so was perfectly happy to make her one. I wear my Stella constantly and I hope that it'll be a garment that my Mum gets a lot of wear out of too. As the weather has been warmer recently it probably isn't the most seasonally appropirate make, but knowing the current weather situation it could easily be hoodie weather tomorrow! I joked here about how I had used the same fabric for all of my hood linings up until that point. Little did I know that I would be using the same fabric again next time I sewed a hood! This is fabric that I had left over from my Kelly Anorak lining (coincidentally also from Higgs and Higgs!) and luckily it matched the other fabric perfectly. I think that the only technical part of the Stella Hoodie is sewing the button holes onto stretch fabric. This fabric isn't that stretchy relative to many other jerseys but I still found that the fabric needed to be guided through my sewing machine in order to sew the button hole. Like I said at the start, it was a really quick make. I was able to use my overlocker for the first time on a knit garment too, which made it even faster to sew - I loved it! The only downside to this fabric is that the inside of it is quite an opaque white which means that the sleeves can't be rolled up. Also, the fabric is quite stiff/scratchy inside rather than soft which is a shame as a soft cosy hoodie would be nicer to put on when it's cold. This definitely isn't a something that prohibits the wear of this fabric though, and it is wonderful fabric in every other sense. Another great make, I am sure your mum will love it. That stripy lining keeps giving and giving! I know your mom is probably loving her new hoodie! The fabric is so luxe, and I love the coordinating fabric in the hood, even if you have used it before. I really like this top and that you are sewing for your mum. What a compliment that she asked you! You are doing some amazing projects. It looks really great, I know what you mean about cosy fabric being better. It could just have a long sleeve t shirt under though, just the thing in cold weather. What a perfect hoodie for your mum. The lining goes so well with it. I adore that grey rib! It's perfect for your hoodie - I shall have to seek some out. Lucky Mum :-) Beautifully done - and leased to hear you enjoyed your overlocker - they do make short work of it all!